When shy twenty-something Eun-joo (Jeong Yoo-mi (정유미) is invited to an exclusive party followed by a night at a new luxury resort in the mountains, she and her friends prepare for a wild time. Hosted within an abandoned coal factory, the group drink and dance throughout the night…until a scarred and disheveled old man crashes the party, claiming that the area is cursed. Unless they all leave immediately, he professes, they will all be damned. Ignoring the old man’s warnings, Eun-joo and her pals continue partying, until they encounter him again in the woods and, during a struggle, kill him. Deciding to dispose of the body within the coal mine, the friends venture into the dark labyrinth, and are horrified by what they find. Tunnel 3D (터널 3D) is a horror film where the embrace of 3D technology has incredible potential to heighten tension. The depth of field it generates has the ability to draw the audience within the claustrophobic environs of the tunnels, to be engulfed in suspense-filled shadows before terrifying situations occur. Unfortunately such hopes are quickly dashed as it becomes obvious within the first few minutes that director Park Gyu-taek (박규택) has constructed a horror film appealing to the lowest common denominator, featuring a generic story and few scares. While there are some enjoyable moments to be had from the antics, led by charismatic actress Jeong Yoo-mi, Tunnel 3D squanders the possibilities the technology affords to become a menial, vacuous offering. The premise of Tunnel 3D is solid – a group of twenty-somethings get lost in tunnels – yet it falters in execution due to a lackluster script and terrible characterisation. Each member of the group is a cliche, ranging from the handsome jock to the nerd, from the shy girl to the promiscuous vixen, and are continually a source of frustration. This is particularly the case when they behave incompetently as such actions are extremely contrived and often downright silly, built into the narrative in order to push the group towards the titular tunnels. Sequences where jock Gi-cheol (Song Jae-rim (송재림) punches people he dislikes, Se-hee (Jeong Si-yeon (정시연) repeatedly emphasises her sluttiness, or the cringeworthy swimming pool sequence, are sources of annoyance that ultimately serve little purpose. The cast all overact their respective stereotype accordingly, with only lead actress Jeong Yoo-mi seeming aware that she is acting within a film rather than a Kdrama. Yet as she has very little development – and ironically, screentime – to work with, Jeong often becomes subsumed within the absurdities although to her credit she tries hard to make the story compelling. Once the group are within the network of tunnels, the horror factor kicks up a notch though more from quick scare tactics rather than atmospheric, unnerving suspense. Certain sequences are effective, spurred on by the attractive cinematography of the contrast between light and shadow in the subterranean environment. However potential is again wasted due to uninspired camerawork and composition, while the scenes of horror are often so farcical they induce laughter. The over-reliance on dream sequences are chiefly responsible for such humour as the ridiculous events that occur and the fake blood that flows are so B-grade it’s hard not to laugh. 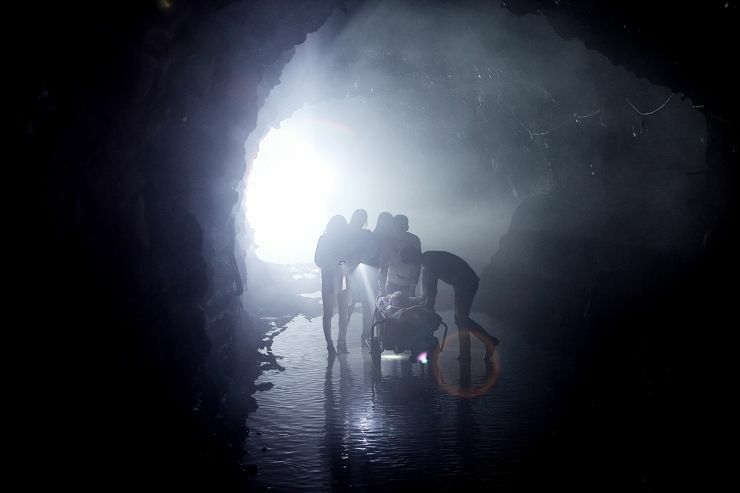 It would likely not be as bad if not for Neil Marshall’s far superior The Descent (2005), which the filmmakers seem to be unaware of as had they taken inspiration from it, Tunnel 3D would undoubtedly be a more effective horror film. As is often the case with Asian horrors, the tendency to add a form of epilogue to wrap up any narrative loose ends is also apparent within Tunnel 3D. It’s unfortunately quite asinine, yet at this stage in the film audiences will unlikely care either way. Tunnel 3D is a vacuous horror film that appeals to the lowest common denominator. While the premise of twenty-somethings getting lost in a network of tunnels is solid, the execution is considerably lacking. Amid the terrible script, abundance of cliches and silly contrivances are a handful of entertaining moments and scares, although they are quick shocks as opposed to deep unnerving suspense. Actress Jeong Yoo-mi is the highlight of the cast, yet even with her talent it is impossible to elevate Tunnel 3D out of being an asinine B-grade horror.